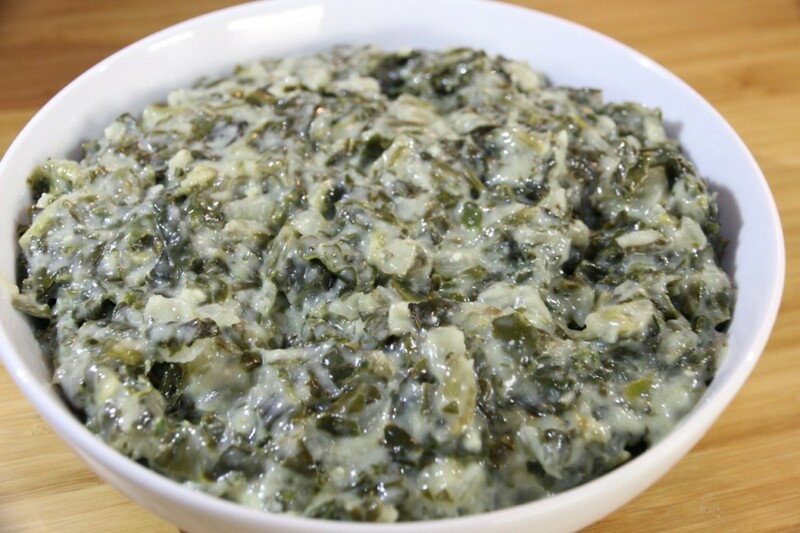 I’ve always had a bit of a love affair with creamed spinach…In my non-vegan days I always ordered it at restaurants, but since going vegan, I hadn’t had it for about 2 years before I realised that I missed it! I played around with different cheese sauces to see which one works best and this one is an absolute winner. 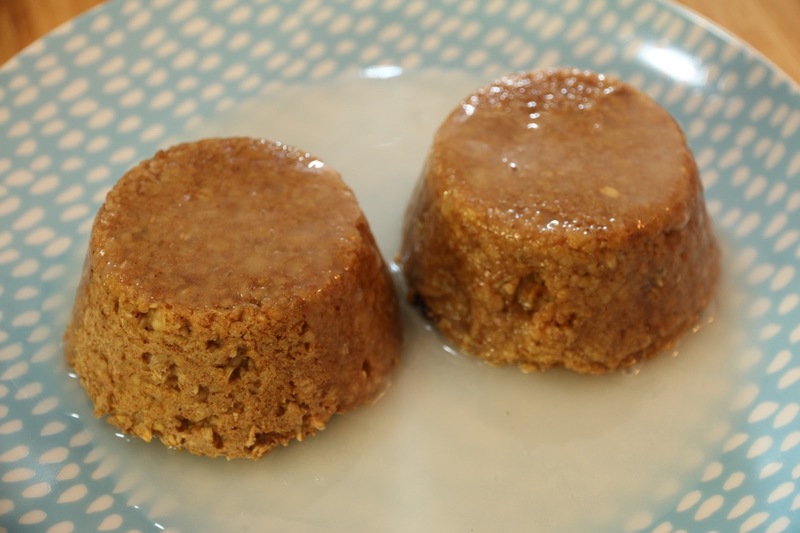 It is super quick to make and completely healthy – no processed ingredients, no cholesterol. Saute the onion in a little oil or just using a dash of water if it catches until translucent. I like to add a heaped teaspoon of crushed garlic and saute that for another 2-3 minutes. Add frozen spinach, put a lid on the pot, reduce heat to medium and allow to thaw. Every 3-5 minutes, remove the lid and break up the chunks of frozen spinach/give a stir, replace the lid for another 3-5 minutes. Keep doing this until the spinach is fully cooked. 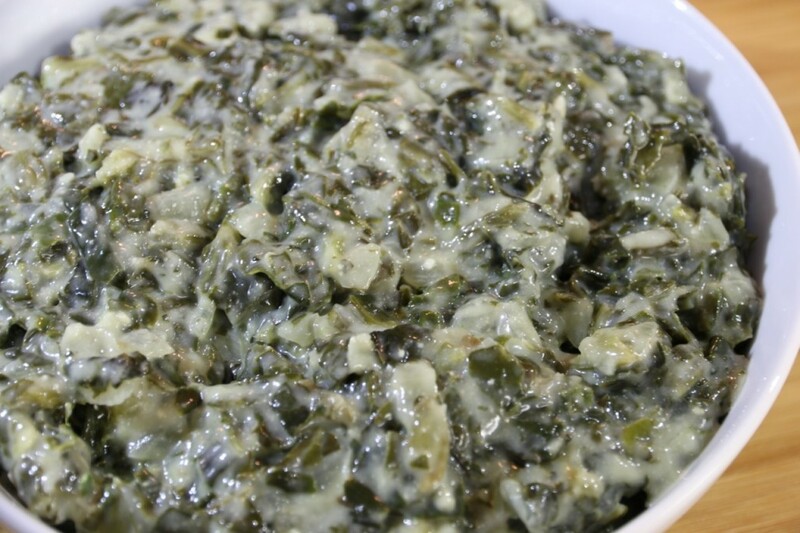 While the spinach is cooking, blend all the cheese ingredients in a blender. If you have a high speed blender like a Vitamix or Omniblend, there is no need to pre-soak the nuts. If you have a regular blender, if possible, soak the nuts in water 8 hours before making it just to soften the nuts and ensure a smooth sauce. If you don’t have time to soak it it is not a crisis though – even if the sauce is not entirely smooth, you actually won’t notice it at all once mixed through the spinach. Once everything is blended, pour it into the fully cooked spinach and cook though, stirring from time to time to prevent it from catching. You will see that as the sauce comes to the boil, the tapioca flour thickens it into a beautifully creamy, thick sauce. Taste for saltiness – add more if desired and serve! 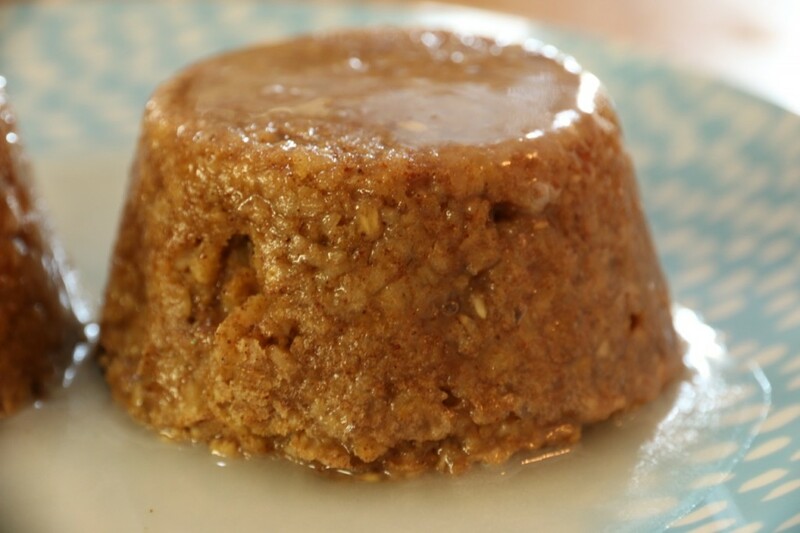 This can be made in advance and stored in the fridge for about 4 days. I present my husband’s favourite breakfast of all time – The oatmeal cinnamon bun by Chocolate Covered Katie. If you haven’t already, please go check out her website – she is a genius in the kitchen! I have tried so many of her recipes and not one of them has been a flop. I make this exactly according to her recipe. I recommend using applesauce and not banana – I have tried both and the texture with banana is not great. I also highly recommend that you use coconut oil and that you do not omit the oil. The flavor is the same but the buttery texture is lost without the oil – it makes a big difference. For the “cream cheese” icing, I just beat (or throw it all in the vitamix) water, icing sugar, lemon juice and vanilla essence. I add quite a bit of lemon juice to give it that sweet/sour tanginess. Another great thing about this recipe is that you can make it in advance. I like to use a large muffin pan (one of those with only 6 large holes and make it the night before. I also make a huge jar of the icing syrup and store it in the fridge for a few weeks. I just reheat the bun in the microwave the next morning and drench it in syrup before inhaling it:D And please – ADD CHOCOLATE CHIPS TO THE BATTER! You won’t be sorry….. 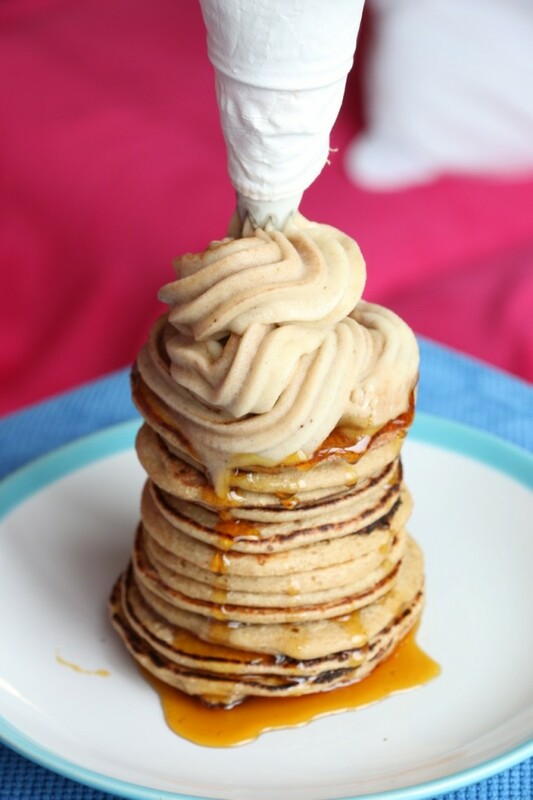 This recipe blows my mind every time….The batter takes 2 mins to whip up and you’re good to go! In addition, you can use the same batter to make waffles in your waffle maker. If you pour the batter thinly into the waffle maker, you get crispier waffles. If you pour it in thickly, you get soft, squishy waffles. If you pour it in thinly and do it really long, you get wafer biscuits! You can also flavor the batter to suit your preferences – chocolate, vanilla, cinnamon etc. 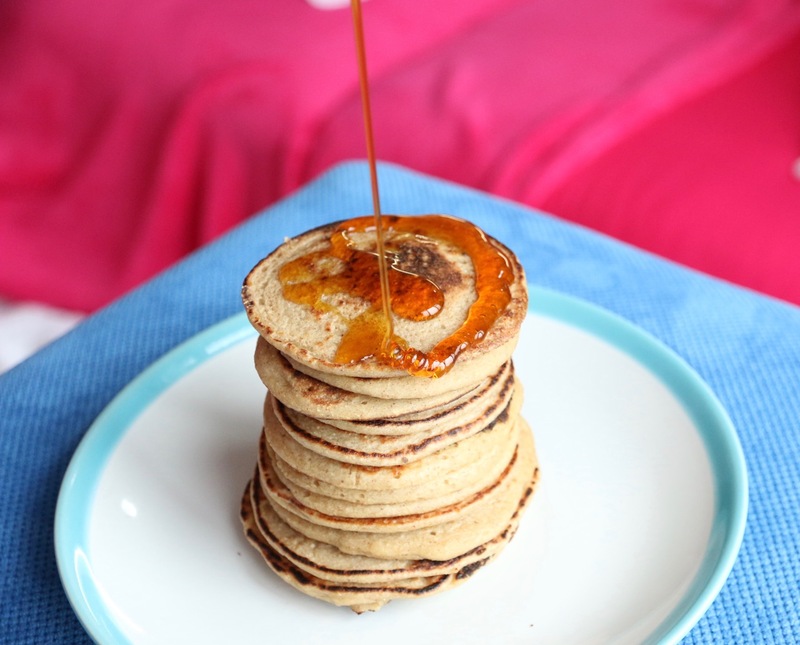 Make 1 cup oats into oat flour. I just throw it into my vitamix and it turns into flour in seconds. You can also do this in your blender or food processor. Now add the rest of the ingredients and blend. Taste it and adjust sweetness etc as needed. 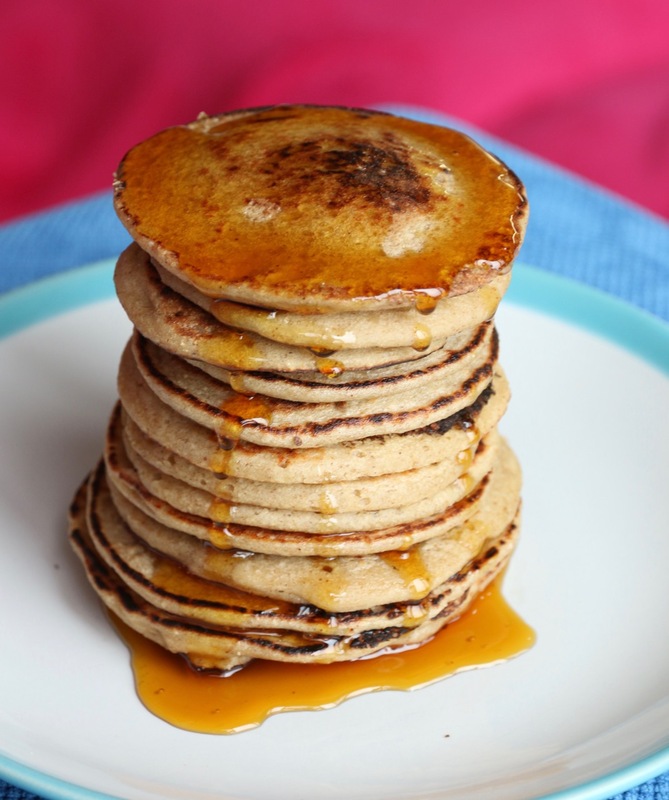 To make pancakes, grease a non-stick pan and heat it. When hot, pour in 2 tablespoons full of batter at a time and quickly spread it into a circle. When the top starts to set, flip using a flat spatula and cook for another few seconds the other side. To make waffles, just follow the manufacturers instructions. Of course, I highly recommend topping it with nicecream and golden syrup or maple syrup:) Another topping idea is this refined sugar free, fat free chocolate sauce. Pour a little bit of water in the base of your blender – maybe 2 tablespoons to start with. Add your fresh banana on top of this. Now add the frozen banana and berries. 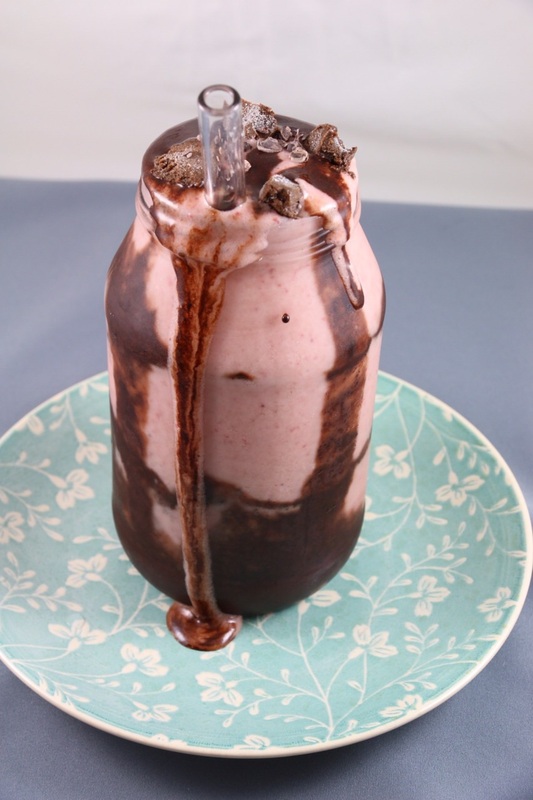 Blend into a smooth milkshake, cautiously adding bits of water as needed to achieve the right consistency. 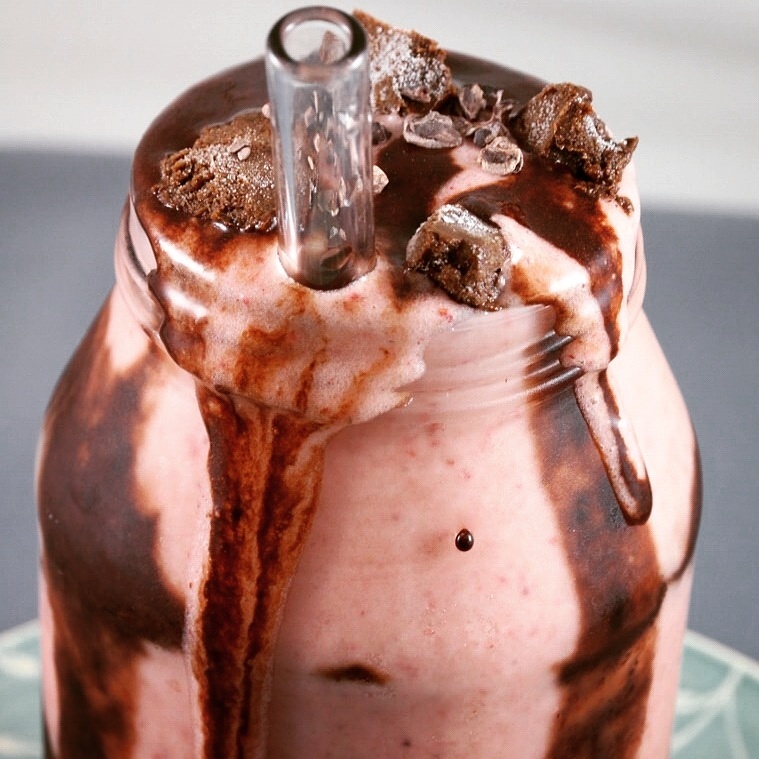 Do not add too much water as you end up with a runny milkshake – and who likes that! 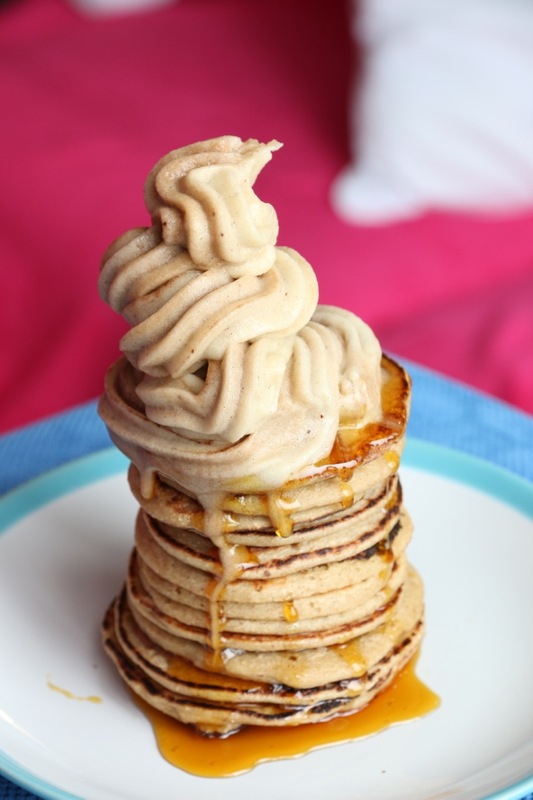 Taste….if more sweetness is needed, add a touch of stevia, agave or maple syrup to taste.